If the guard does not either swipe at a pre-configured card reader or activate a pre-configured input within the guard tours parameters, an alarm will be sent to the AC2000 Security Hub application. The AC2000 Guard Tours application also gives the option to temporarily suspend and resume a tour e.g. if there is an issue on the tour and a guard decides to investigate further, the tour can be suspended until the issue is resolved. 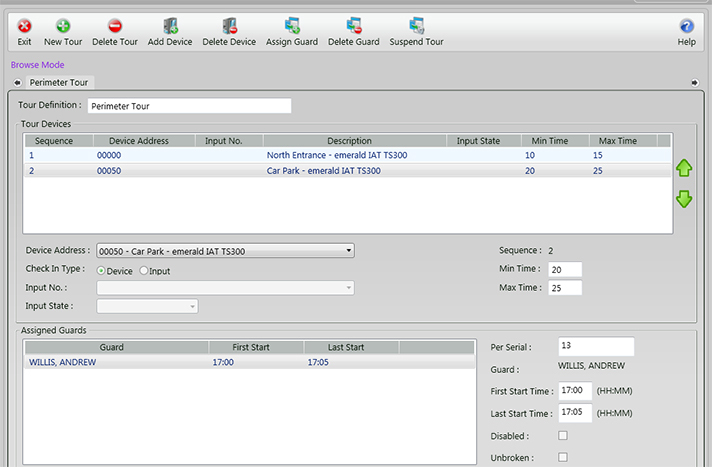 Advanced AC2000 Guard Tour reports provide the ability to report on all tours, a specific tour or a specific guard. AC2000 Guard Tours is a valuable resource for all companies who want to ensure their security guards are securing the premises as per procedures. This is a particularly useful tool for night time duties.